TUCSON, Ariz. -- NASA's Phoenix Mars Mission generated an unusually high volume of spacecraft housekeeping data on Tuesday causing the loss of some non-critical science data. Phoenix engineers are analyzing why this anomaly occurred. The science team is planning spacecraft activities for Thursday that will not rely on Phoenix storing science data overnight but will make use of multiple communication relays to gain extra data quantity. "The spacecraft is healthy and fully commandable, but we are proceeding cautiously until we understand the root cause of this event," said Phoenix Project Manager Barry Goldstein of NASA's Jet Propulsion Laboratory. Usually Phoenix generates a small amount of data daily about maintaining its computer files, and this data gets a high priority in what gets stored in the spacecraft's non-volatile flash memory. On Tuesday, the quantity of this data was so high that it prevented science data from being stored in flash memory, so the remaining science data onboard Wednesday, when the spacecraft powered down for the Martian night after completing its 22nd Martian day, or sol, since landing, was not retained. None of that science data was high-priority data. 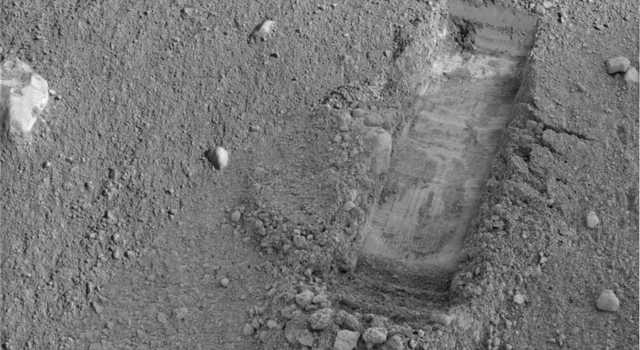 Almost all was imaging that can be retaken, with the exception of images taken of a surface that Phoenix's arm dug into after the images were taken. To avoid stressing Phoenix's capacity for storing data in flash memory while powered off for overnight sleeps, the team commanded Phoenix Tuesday evening to refrain from any new science investigations on Wednesday and to lower the priority for the type of file-housekeeping data that exceeded expected volume on Tuesday. "We can continue doing science that does not rely on non-volatile memory," Goldstein said. Most science data collected during the mission has been downlinked to Earth on the same sol it has been collected, not requiring overnight storage, but on some sols the team has intentionally included imaging that yields more data than can fit in the afternoon communication passes. This has been done in order to take advantage of the capacity to downlink additional data during communications passes on the following Martian mornings. In the short term, while the root cause of the unexpected amount of housekeeping data is being determined, the science team will forgo that strategy of storing data overnight. Meanwhile, extra communication-relay opportunities have been added to Thursday's schedule, so the science plan for the day will be able to generate plentiful data without needing overnight storage. Trench-digging, imaging and weather monitoring are in the plan.